So I went to the Royal Ontario Museum today to see the Mesopotamia and Wildlife photography exhibits and somewhat ironically forgot my camera. It was fine in the end because they did not allow photographs in those specific exhibits anyway but when I got home I was wondering what I could take a picture of that was still out of history, though perhaps not as far back as say the dinosaurs… In my parents basement I saw this, our old hockey game that my Dad found when I was a kid in a building that was going to be demolished. 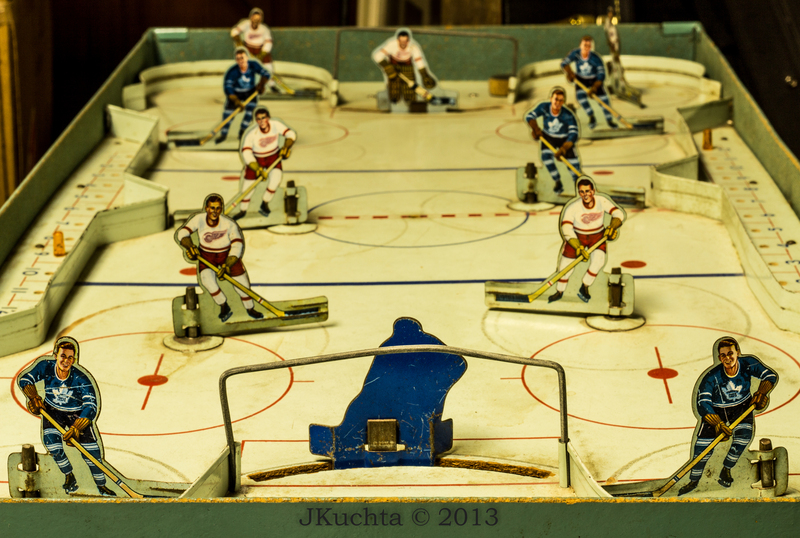 All mechanical and with interchangeable players from all the original six teams in the NHL. Now I have never been a hockey fan but this is still a great game to play even now.